Ok so after forgetting my blunderbuss come with shields I have added a permanent shield wall to their movement tray using spare rails from the GW movement tray set. Also I have added a removable shield wall for the hobgoblins who in a 2200 point tournament tomorrow get the benefit of shields. Let's hope they perform well or it's back to the slave pit for those dudes. 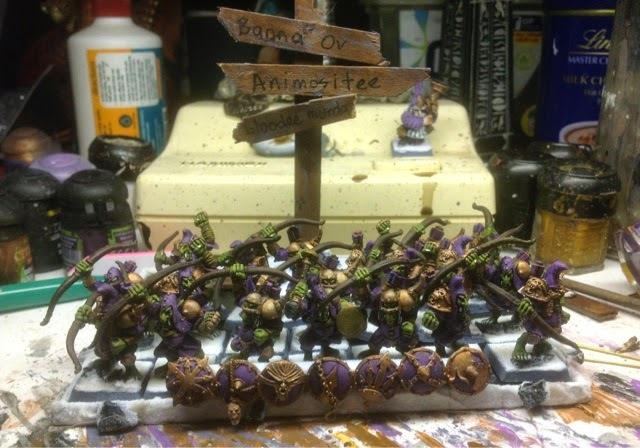 The banner of animosity has removable signs for the various states of hobgoblin animosity. Should get me an extra point for hobby! My tournament list is built around a level 4 sorcerer, BSB, chaff chasing/ redirecting khan on a wolf, 20 great weapon infernal guard, 29 blunderbuss, 20 archers, kdaai destroyer and a hellcannon. The blunderbuss and warriors will anchor my flanks with the hellcannon hopefully not running towards the enemy. I tend to try to hold back the kdaai as most expect him to venture out- I prefer to hold him back and use the khan to take out redirectors and then choose my charges with the big guy whilst hoping he does not burn out too quick or get taken out by cannon balls. Small list but I am keen to again take to the field of battle of a tournament after 12 months off. Photos and tournament run down to follow over the next few weeks.